We have all read a book and have had unanswered questions. 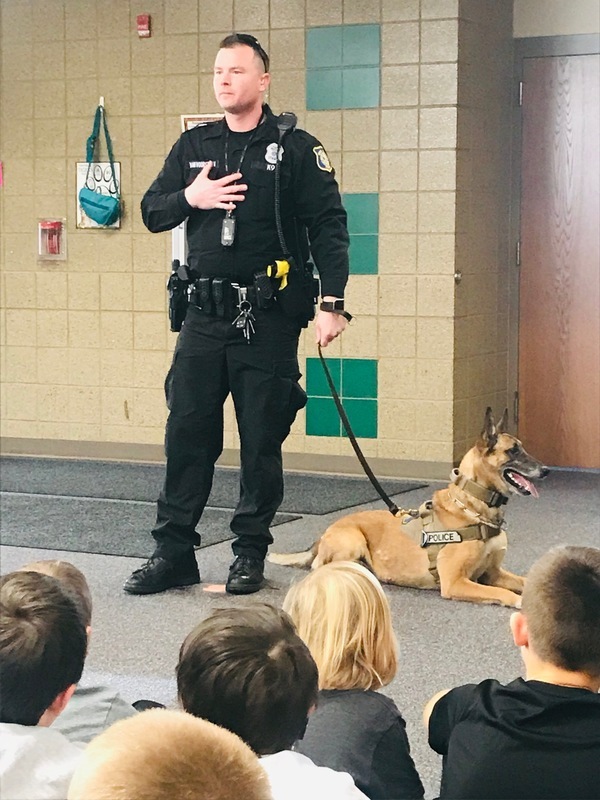 That wasn’t the case when the third graders at Explorer Elementary got a surprise visit from Officer Grant Van Voorst and his K-9 Doerak from the Sioux Falls Police Department. Michelle DeBoer, Stacy Nowak, and Justin Pudenz, the third grade teachers at Explorer Elementary, had a surprise for their students. After reading a short story called “Aero and Officer Mike”, these three teachers thought it would be great for their students to learn more about an officer and his K-9. In the short story, the students learn how K-9s are trained and what their duties are when they are on and off the job. Officer Grant and Doerak, came to talk about their job and answered many questions the kids had. The kids asked many questions about Doerak and what his duties were when they were on and off the job. Officer Grant showed the kids that he had a button that would open the back seat to his vehicle to let Doerak out if he was ever in trouble or needed assistance. Grant and Doerak have been working with each other for a little over a year. Grant was the handler of Max who retired after 8 years of service in 2017. If Doerak would ever see Grant in trouble he would do anything he could to help him out. Officer Grant speaks German when he is giving commands to Doerak. “When he (Doerak) sees me in uniform he knows it’s time for work. If we’re at home relaxing he’s just like any other dog but a little more protective.” Grant lets Doerak interact with his children but they know they have to be careful when approaching him. “No one should ever come up behind a dog that they don’t know, especially Doerak. He is trained to protect himself and may get aggressive if he feels threatened,” said Grant. Before the kids came out of their rooms, Officer Grant had hid a sock that was sprayed with a scent that Doerak is trained to find. He hid this in one of the students lockers and wanted to show how kin of a nose Doerak had. Grant let Doerak loose and in little or no time Doerak sat and gave the sign that he had found the item. Grant opened the locker and there it was! The kids were amazed at how fast Doerak was able to locate the sock. “It was cool watching Doerak sniff the lockers and find the one that had the sock,” said one of the third grade students. We all appreciated Officer Grant and Doerak taking time out of their busy schedule to come visit and answer questions the students had. It was great for the students to experience and see up close how much training is required to keep our community safe!